Rio met Rave after training this week. She was very appropriate and gentle, which is a little weird to see in Ri! She wasn’t 100% convinced he was a real dog, mainly because he’s not allowed to run wild and free just yet. 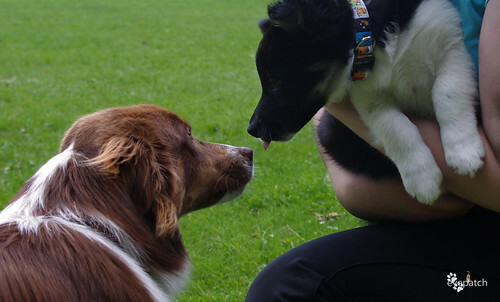 Puppy socialisation is something I wanted her to do – that’s socialisation with puppies younger than she is! – but it depends quite a lot on other people getting puppies, so it’s not always possible. Katie has timed it just right. We’re also puppy sitting Alfie for the next two weeks; Alfie is seven months, so it will be interesting to see how he and Rio get along on a day-to-day basis. Rio stepped up to two hurdles this week. You can see what a puppy she still is as she runs, but also what a different kind of movement she has anyway compared to the collies. 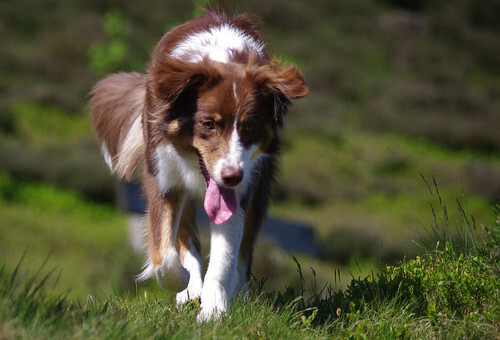 Border collies (like Dyl) run with a much lower action, head down. Rio will flatten off as she matures and drives forward more, but no where near as much as Dylan does. We’re still working on a bit of box work at home, and she’ll probably step up to three hurdles in a few weeks, and then four toward the end of the month. Many thanks to Katie for the video! I think skipping agility class for a few weeks is a good idea. I needed to scale back a bit, and focus on getting her working attitude when we’re working together in the park, or at competitions in the exercise area, and of course at flyball training. 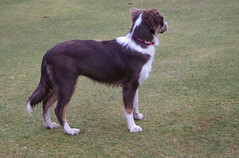 Well, she’s always focused at flyball, it’s all running and no thinking right now. Rio’s favourite kind of game! 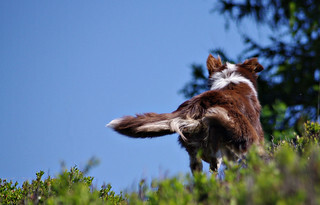 Once I feel like she’s focusing and working when I ask her to, regardless of where we are, we’ll head back to agility. I sort of missed this step out, and went from home to agility class. I’m feeling a little pleased with myself for spotting it though, and for taking the action to correct it before we got any further down the wild unfocused puppy path. Rio is 10 months old now, and although I occasionally panic and think we haven’t done nearly enough for her age, I’m actually really happy with how she’s going. Ri’s foundation has held up, and so far nothing has really phased her in training terms. Everything feels like a very natural progression, and it’s such a relaxing process for both of us. Her contact training is also going great! She’s offering the 2o2o position whenever she sees the board and we’re just having fun with it. I’m not touching her or moving her into position, it’s about her making the choice to rear-paw target to the board and get into position. Very little movement yet, I’ll start adding that in soon, but I am very happy with how it’s looking so far. I will film it soon! Ri seems to be going through a fear period right now, which is a little weird and a little frustrating for me. She is fine with other dogs and in different situations, but has decided that all strange people are scary. She does seem to have a quick recovery time once she has freaked out, but I really don’t like that she’s doing it at all. I hope it’s just a phase and she’ll mature out of it (somebody reassure me!). She has also come down with a tummy bug, nothing serious but it did prompt a vet trip this morning. She has put on some weight in the past two weeks which confirms my suspicions that she’s done a bit more growing as well. She alarm-huffed at a small boy in the waiting room, so we did some Look at That! shaping (which ended when Rio decided Look at That! was boring, and that offering to shape with one of the chairs would be more fun). She reacted appropriately when she was scared, moving away and giving off lots of calming signals, but not really what I wanted to see. Because of the tummy upset she won’t be going to Dogs Unleashed this weekend. It doesn’t seem to be infectious (it’s not what Dylan had, and the girls don’t have it), but since she’s dealing with that, exposing her to hundreds of other dogs isn’t a great idea. Might be the best idea anyway if she is in her teenage fear period, but I think she would have had fun lure coursing and playing baby agility. Fingers crossed the show is going ahead, considering the weather. 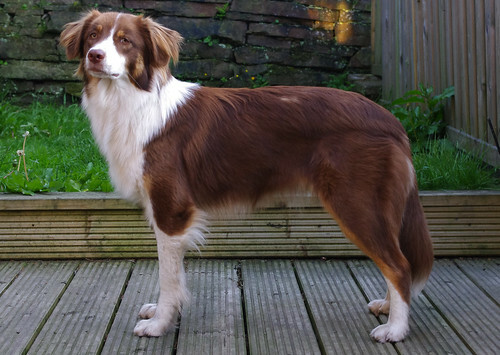 Dylan and the old ladies are due to flyball tomorrow, and Dylan is in the agility on Sunday. Turns out Rio is an evil genius, who knew? She was flawlessly perfect at agility training this week. Crazy enthusiastic but uber focused and keen, choosing tuggy over distractions (even in the form of that mistress of temptation, Fly!) and working like a super puppy. We started with some recalls through tunnels, which is always a nice way to begin, and then did some work down a line of four jumps. I thought she’d struggle with the line since it’s a step up from what we’ve done before, and she has shown a slight tendency to veer in towards me. Typical baby dog stuff! Apparently it’s not a problem though, she was running on to her tuggy beautifully and seemed to really understand her job. We finished with some send on to tunnels and then back down the line of jumps. I was gently introducing the idea of a rear cross as she went into the tunnel but she had no problems with that, tunnels are fun. I still think I might give her some time off for a while, as we do still need to work on her focus, and I need to make a plan for the next few months. I can do foundation and I can do agility training, but the transition from foundation to actual agility is the part I find difficult. Dylan got to skip this training session as well, although he’s much improved after his trip to the vet. I think he’ll probably be fine to go to flyball training on Thursday evening, especially since it’s only boxwork for him anyway. I decided today we needed to get out and do some agility training elsewhere, so I loaded a jump, Kim, and Rio into the car. It’s finally feeling like May, no rain! No sunshine either, but it’s warm outside, enough that I can wear my crocs and give my poor feet a break. I rubbed the back of my ankles raw a few months ago, and the skin has not recovered yet. Doesn’t seem to matter what footwear I’ve got on, I still end up with plasters all over the back of my feet by the end of the day. Not great for running with the dogs. Rio did well, some super kips (wing wraps) and go ons. I am a little unsure as she’s not paying full attention when we train like this, but I’m not sure if I’m just asking too much of her at this age. Her attention span varies, sometimes she’s 100% focused and other times it drops, and things are distracting. Her enthusiasm is always 100% though, so it’s a hard one to fathom. Pretty pleased with her though, all the same. She’s working her wraps at 8″ now, and it’s still looking good. 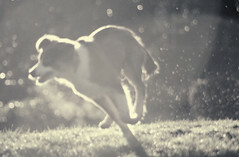 I’m excited by the prospect of having a big dog to run who can actually turn! Kim played around a little bit as well over 8″, I want to build her muscle tone back up so she’s on a fitness mission. She is entered at Penrith in June because she still loves working, and the jump height isn’t a problem, but she’s not quite as strong in her back end as she was. 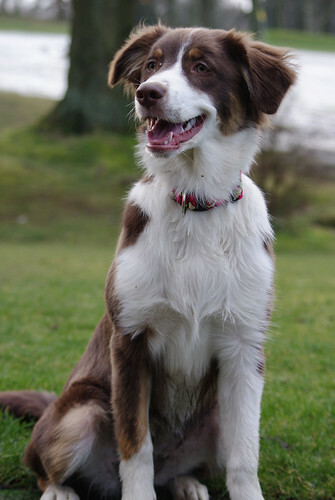 That’s the lack of flyball training kicking in, I think, but she should get back to that soon as well. I’m almost sure she’s going to be going back and doing some Starter tournaments this year, which will keep her happy! Our homework paid off! I had a pocketful of treats but my plan was only to use them if necessary, but it wasn’t. Rio was much more switched on to her tug, and much more focused overall. I also realised I don’t need to be treating her every 10s when the other dogs are working, she will sit and watch on a loose lead. Cuddles and occasional tuggy is fine for rewarding her in that situation. I love seeing the work we did a few months ago pay off! I’m sticking with my rule of “running off = out”. This usually happens towards the end of the session as Ri starts to lose her concentration, but I don’t want to fight for her attention. She has to want to work with me, and if she decides something else is better, then we wander quietly back to the car and she goes away. Dylan did a few sequences and it become increasingly apparent that he was feeling very sore in his back, so I pulled him. Rio was being particularly ‘enthusiastic’ about bodyslamming him last week, and then flyballing over 14″ at the weekend probably made it worse. I am obviously working on training Rio not to cripple Dylan, but it’s not an easy fix and she has a very Aussie attitude to getting the attention of dogs and people (ie. launch yourself at them). Because she doesn’t do it to the other girls — who have rightly flattened her for trying it, compared to Dylan putting up with it — it’s only something I can train when Rio and Dylan are walking together. But that increases the chances of it happening at all! I’ve thankfully managed to get Dylan an appointment with the chiropractor tomorrow morning, and we’ll see then whether he’ll be able to run at UKA Dig It this weekend. I’m not holding out much hope. Rio has definitely got a case of the puppy fuglies this week, she’s all legs, long body, no neck/chest, tiny head. And the ears are all over the place. Thankfully I did get one photo of her looking pretty! She’s greeting all people enthusiastically at the moment, which isn’t so good when she launches at them. I’m quite strict about feet-on-the-floor for greeting but a lot of the other people she meets aren’t, I’m going to have to start training people I think! She’s also happy to meet other dogs on the lead or off-lead in groups, but if we meet individuals on our walks she tends to get the zoomies rather than actually greeting them. Not entirely sure how to get round that one. Ree also got a bath this week. She loves being bathed, I have to keep standing her up as she wants to sit and doze under the nice warm shower water. She’s also much more co-operative about being dried with a hair dryer, which has been a work in progress. We have had a backslide on nail clipping, as her nails have hardened she has decided she hates nail clipping. Unfortunately she’s not doing enough walking yet for them to wear down naturally so I really need to get on with that! I also need to go collar shopping, she’s outgrown her Dublin Dog puppy collar and their next size up is too chunky for her neck at the moment. I have been trying to get Rio to some busier places this week, hence our park trips and village walks. It’s a bit difficult as due to our walking locations, social night-time walks feel too uncomfortably unsafe (even if they’re perfectly safe), so we’re limited to daylight strolls. Sadly, not many people around during the day compared to evening or early morning, and as flyball training was cancelled last week we missed our social weekend too. 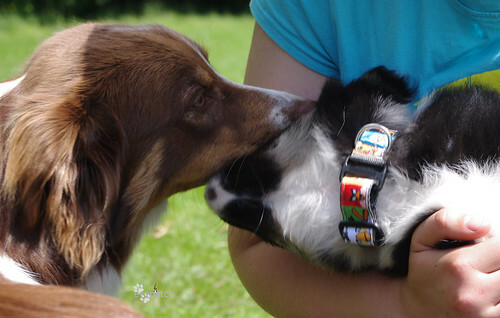 I’m hoping Rio can come join me at agility on Tuesday for some socialisation but it takes pre-planning as I need to help set up and get Emma to take the Foundation class. We’re working on shaping a nose-touch (or ideally mouth-grab) behaviour at the moment. Rio loves mouthing people or dogs (yes, need to stop that!) but she has a very strong preference for her paws when we’re shaping with objects. Thanks to some help from Cat (DogRadical) and Vicki (Giruff) we’re making good progress but it’s definitely the most challenging thing we’ve done so far as it’s not really working with her natural inclinations. Wait training is ongoing, REA is ongoing, but both looking good. Need to start her on the chute for flyball sometime this month. Almost all her baby teeth have gone, the last few molars went this week. Ears are all over the place, I love watching puppy ears change. Currently we seem to have drop ears in a morning and then by evening we’re back to airplane, but this week the drop ears have been around a lot more. 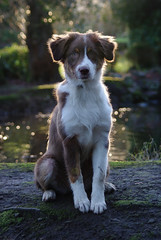 Maybe she will have proper Aussie ears?! Rio also has a tiny scab just to the right of her nose at the moment, which I have little sympathy for. I accidentally dropped a peice of pasta on Kim, which bounced and landed next to her paw. Rio ran over, shoulder barging Kim out of the way to get to it. Wrong move! Kim did not approve and told her emphatically so. Kim didn’t actually mean to catch her but Rio panicked and tried to reverse unexpectedly. Kim was apologetic to everyone after all the screaming and Rio has reverted to super-respectful behaviour, and I am a terrible owner because I’m not at all sympathetic. They’ll all survive! 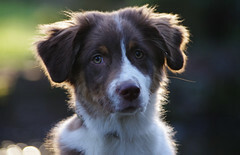 Been reading lots of interesting blog posts about all the focussed training people are doing with their puppies. I haven’t been, but I’m actually happy with that. I’ve been much more interested in getting Rio to explore the world and get as much exposure to different people, dogs, and environments, and teaching her how to react and recover. So far so good! We do need to get out and do a bit more training elsewhere though, although it isn’t something I foresee being a problem. Rio is always ready to tug wherever we are, and will offer her tricks for treats if she thinks there’s half a chance of getting some food. I’ve never known a puppy so into both food and toys, it’s weird being able to switch so easily between them! Her favourite toy is a proper sheepskin or fleece tug, but I really want to keep that in it’s current status as Best Toy Ever, so we only use it once a week for restrained recalls. We tug with other toys in the meantime. She’s teething at the moment and apparently this is not an issue, she spits them out and then carries on with whatever she was doing. Dylan had a tendency to bleed everywhere. It probably helps that she loves a frozen Kong or icecubes which is numbing her gums, Kim did too. Dylan didn’t, icecubes were far too cold (he was a summer puppy!). He likes them now though and hoovers up around Rio as she chews. My big priority over the holidays was REA and waits, both looking pretty nice right now. She’s targeting a biscuit tin with either rear foot (I’m rewarding attempts to target too at the moment) and I’m really pleased with progress. Waits are also looking nice, she’ll hold in a sit for 15-20s whilst I move 5-6ft away. I’m sticking with my policy of not setting her up to fail, there’s no point in asking her for a 60s wait while I move to the other end of the room. Likewise if we’re on walks, I don’t recall her if she’s clearly not going to come back. Not in a “omg Rio is running in the opposite direction after a squirrel” kind of not coming back, but if she pauses to sniff at something, I’ll wait until she’s moved on before calling her. So far so good, she doesn’t argue about recalls.